New green methods for making hydrogen fuels. Microrockets that can circulate in the human body without external fuel. Improved seismic safety in hospitals and other structures. New approaches to help utilities integrate solar power into the energy grid. Self-healing hydrogels that could ultimately be used for medical sutures, targeted drug delivery and other applications. New approaches that could extend the life time of solid-state and non-volatile memories technology. 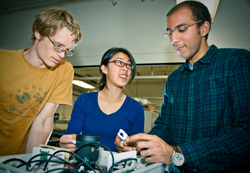 This is just a small sample of the leading-edge research projects that graduate students at the Jacobs School of Engineering at the University of California, San Diego will present to attendees of Research Expo on April 12, 2012. Research Expo offers the opportunity for engineers, scientists, recruiters, companies and potential investors to meet the top engineering talent of the Jacobs School; learn about tomorrow’s innovations before the advances are widely known; and spark collaborations. Click here for a complete list of Research Expo posters. You will have to register for the event to have access to abstracts. More than 230 graduate students will present their latest work at the posters session from 1:30 to 4:30 p.m. Faculty members from each of the Jacobs School’s departments will talk about their groundbreaking research from 2:30 to 4:30 pm. The networking reception from 4:30 to 6 p.m. offers Research Expo attendees the opportunity to meet students, faculty, alumni and professionals from industry, government and nonprofit sectors. Jacobs School graduate students are doing high-impact, game-changing work in many fields including energy, health and medicine, information technology and structural safety, including the following projects to be presented at Research Expo 2012. Bioengineers working in Professor Shyni Varghese’s lab have developed a self-healing hydrogel that binds in seconds, as easily as Velcro, and forms a bond strong enough to withstand repeated stretching. The material, which is made of linked chains of polymer molecules, has numerous potential applications, including medical sutures, targeted drug delivery, industrial sealants and self-healing plastics, the team reported March 5 in the online Early Edition of the Proceedings of the National Academy of Sciences. They will also present their findings in a poster at Research Expo. 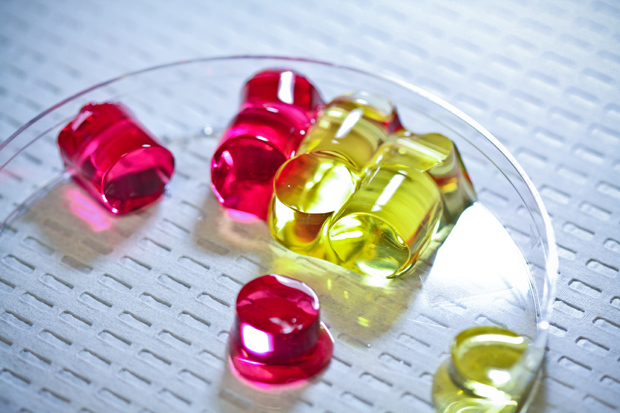 Ameya Phadke, a fourth-year Ph.D. student, said the hydrogel’s strength and flexibility in an acidic environment – similar to that of the stomach – makes it ideal as an adhesive to heal stomach perforations or for controlled drug delivery to ulcers. Use of hydrogels has, until now, been limited because researchers had been unable to develop gels that can rapidly repair themselves. The team overcame this challenge with the use of “dangling side chain” molecules that extend like fingers on a hand from the primary structure of the hydrogel network and enable them to grasp one another. A five-story building on the world’s largest outdoor shake table at the Jacobs School. This April, a five-story building will undergo an unprecedented series of seismic tests at the Englekirk Structural Engineering Center at the Jacobs School. Graduate students, under the direction of Structural Engineering Professors Tara Hutchinson, Jose Restrepo and Joel Conte, will present different aspects of the project at the Research Expo. 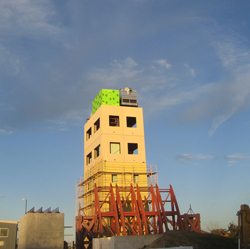 The tests for the first time bring together in one building a broad range of non-structural components, including a functioning elevator, stairs, ceilings and passive and active fire suppression systems, such as sprinklers and partition walls. In addition, the building’s top two floors are designed as hospital spaces, namely an intensive care unit and surgery suite. Researchers are working closely with a wide range of companies and design professionals to ensure that their findings are translated into practice. Students working in lab of NanoEngineering Professor Joseph Wang have developed microrockets that use acid as a fuel, overcoming a major barrier in the quest to build nano-scale rockets that can circumnavigate the body, detecting cancer cells, delivering drugs and isolating biomaterials. Until now, the team’s nanorockets were powered by hydrogen peroxide, which can’t be used in the human body. The hydrogen-bubble propelled rockets are composed of an outer layer of polyaniline and a zinc core that reduces acids, generating hydrogen bubbles that propel the rocket. Graduate student Wei Gao, who has a poster about the work, said these microrockets can move efficiently in a variety of biological fluid including human serum, urine and cell culture media and can be used for a range of biomaterials such as cancer cells, DNA, protein and bacteria. One version of the rockets that is propelled by oxygen bubbles has achieved speed of 1,400 body lengths per second in temperatures similar to that of the body - a record speed for all artificial nanomotors. Students in Prof. Jan Kleissl’s lab at work on a sky imager, a forecasting device. By 2020, 33 percent of the energy produced in California will come from alternative sources such as solar and wind power. But output from these alternative sources is inherently variable. A group of graduate students and their advisors at the Jacobs School of Engineering are helping utility companies cope with the variability. They will present their work in a collection of posters at Research Expo. The posters describe advances in refining forecasting methods that will allow companies to predict how output from solar power sources fluctuates. Solar forecasting research at the Jacobs School has recently received a boost with the creation of the Center of Excellence for Renewable Resources and Integration, co-directed by Professors Carlos Coimbra and Jan Kleissl, from the Department of Mechanical and Aerospace Engineering. Nanotrees from the lab of Prof. Deli Wang. 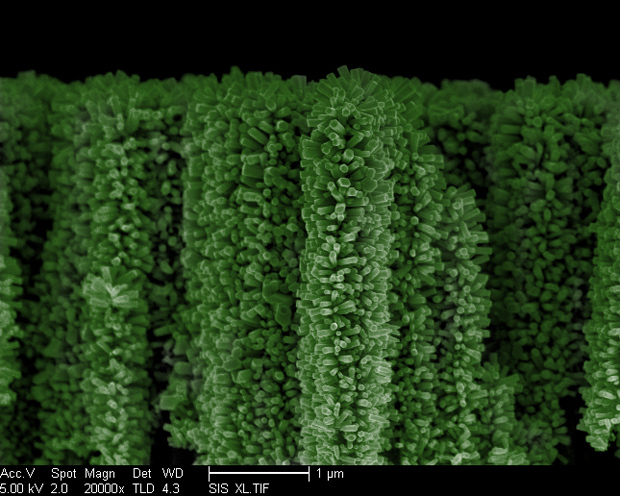 Researchers are building a forest of tiny nanowire trees in order to cleanly capture solar energy without using fossil fuels and harvest it for hydrogen fuel generation. They are presenting their findings in a poster at Research Expo. The trees’ vertical structure and branches are keys to capturing the maximum amount of solar energy because they grab and adsorb light while flat surfaces simply reflect it. “Hydrogen is considered to be clean fuel compared to fossil fuel because there is no carbon emission, but the hydrogen currently used is not generated cleanly,” said Ke Sun, a Ph.D. student in electrical engineering. The vertical nanotree structure also maximizes hydrogen gas output, where very small gas bubbles of hydrogen can be extracted much faster. Working with Professor Deli Wang, from the Department of Electrical and Computer Engineering, the team’s “3D branched nanowire array” uses a process called photoelectrochemical water-splitting to produce hydrogen gas. “We are working on different materials for the tree trunk, branches and leaves – particularly from cheap, earth-abundant, and chemically robust materials – for low-cost, high efficiency, and practical production of hydrogen fuel,”, said Alireza Kargar, another Ph.D. student in electrical engineering. Non-volatile, solid-state memories help power many of today’s electronic mobile devices but the technology could hit a wall as early as 2024, Research Expo alumna Laura Grupp said in a recent study that received extensive media coverage. Several posters at Research Expo 2012 explore ways to improve solid-state and non-volatile memories, and to extend the technology’s life span. For example, one poster, from the labs of Computer Science Professors Rajesh Gupta and Steven Swanson, is proposing a new architecture for solid-state drives that would eliminate input-output bottlenecks between devices and make better use of new storage technologies. The fundamental challenge that researchers will need to tackle in the future is that while flash density continues to improve, its reliability, endurance and performance are all declining.